…time to say goodbye and send off another graduating class from Michigan State. This past week was deemed “Senior Week” and offered various activities for seniors to participate in as they prepare for their graduation ceremonies next weekend. Most of these activities could now be considered “traditions” of MSU, if you will — things such as climbing up into the bells of Beaumont, taking a picture with Sparty, or signing the rock are all part of celebrating “Senior Week”. 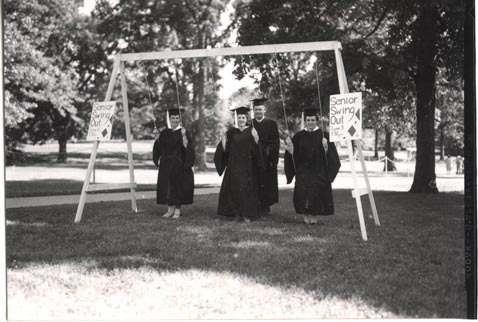 MSU has had a long history of following traditions associated with the time of graduation and the end of the school year [for more information on graduation traditions click here]. The end of the school year marks a transition point for many students; freshmen are no longer the ones at the bottom of the food chain and the seniors say goodbye to MSU to begin another journey. 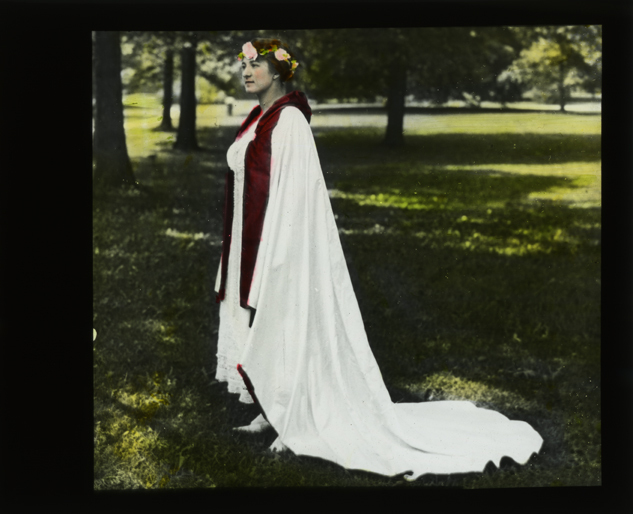 In the early 20th century, during the beginnings of MSU, the students held an important event marking this tradition. “Cap Night” as it was called was the closing point for the end of the school year. In the early days of MSU, all freshmen and preps were required to wear “beanies” or freshmen caps. This would denote their status as the youngest on campus and often times even be the cause of some bullying, such as being pushed in the Red Cedar or being harassed on their walks to class. At the close of the end of the year term, the old night shirt parade would take place. In 1908, this tradition was modified to include a ceremonial fire in “Sleepy Hollow”, the depression between the music building and Beaumont Tower. Into this fire, on each “Cap Night” freshmen and preps threw their caps in this fire symbolizing the end of their year as the youngest at school. It is often times very hard now-a-days to come across one of these beanies for most of them were all burned! – however, here at the archives, we are preservers of history and actually do have one! In addition to freshmen tossing their beanies into the fire, the seniors, beginning in 1910, would show up in their cap-and-gown and would toss their textbooks or old catalogs (if they sold their textbooks) into the fire. MSU Historian Madison Kuhn notes, “Three of the five classes thus discarded their badges of slavery”. This ceremonial “Cap Night” was a fun tradition marking the end of a long school year and a transition into the next chapter of life. The first week of May brings with it a plethora of mixed emotions and milestones. The freshman class has now officially graduated from being the ones at the bottom of the food chain, the sophomores gear up for what could be their most difficult year academically, the juniors begin to develop the famous “senioritis” disease, and well, the seniors…they are ready to move on to the next chapter in their lives (most of them that is). The senior class will look back on their 4, or 5, or 6, (goodness, I hope not 7) years and remember their time spent at MSU. The week of finals will bring frustration as students attempt to cram for their final exams yet at the same time it will bring a sense of relief at the end of the week knowing that we are done. Seniors at MSU often find themselves feeling a greater sense of relief than most other students. Gearing up for their final week and commencement ceremony at MSU, the seniors often participate in activities during senior week such as painting the rock together, or attending a baseball game. End of the year traditions for seniors have been in existence at MSU for quite some time. Although they have changed over the decades, we still honor our seniors by organizing fun events to mark the end of their road at Michigan State. Here is a look back at some of MSU’s historical traditions that occurred for seniors or just some that marked the end of the year. 1911 marked the first year of what was perhaps the most important event to graduating seniors in the early to mid 20th century. “The Senior Swing Out” as it was called, marked the first time that each year’s graduating class appeared in their stately academic cap and gown. This tradition was originated by the class of 1911. The cap and gown was actually first worn by the class of 1910 however it was until 1911 that a formal Swing Out was held. Students would line up in their graduation outfits and would walk from the Senior house, past faculty row, to the Coop (Morrill Hall), past the library, around the ruins of old College Hall, and into Sleepy Hollow (Adams Field). The class numerals were then formed from the lines of the students. As the years went on, there was a “Senior Swing Out” committee made up of members from the Senior Class Council. This tradition continued until the early 1960s. Another fun tradition held by the senior class was the Senior Stunt Days. Every spring, the senior class would stage a series of stunt days. Goofy costumes were worn and the soon-to-be alumni would participate in “merry-making” traditions. Dances, picnics, mock track meets, weenie roasts, and many other forms of amusement all contributed to making each of these Senior Stunt days memorable to the graduating class. The May Morning Sing was yet another tradition for the senior class, in particular the graduating females. This tradition, more of a serious one, was when the future members of the Mortar Board and the Tower Guard were “tapped.” The graduating seniors of the Mortar Board, an organization dedicated to community service, would hand down their tasseled caps to the chosen Juniors who would be the following year’s board members. At this same ceremony, the graduating Tower Guard females would hand the gold and red ribbons to members of the freshman class who would continue this tradition. Membership in Tower Guard is founded upon four “pillars”: leadership, service, scholarship, and character. Tower Guard, now a co-ed honors and service organization comprised of approximately 75 select students taken from the top 5% of the sophomore class, still celebrates the May Morning Sing. Though the ceremony often takes place in April, the group upholds the tradition of gathering incoming members and their families at Beaumont Tower in the early morning for a surprise induction ceremony. At the tower and the following welcome breakfast, inductees learn about their upcoming opportunities and responsibilities in partnership with the Resource Center for Persons with Disabilities (RCPD). Each Tower Guard class contributes over 6,000 hours of service to the RCPD, converting textbooks to accessible formats, like Braille or electronic text, and reading tests to individuals with visual impairments and learning disabilities. At the end of the evening of the pageant there was a contest to see who would be crowned the “Queen of May”. There were eight senior girls who were thought to be a good fit for the office and a girl dressed up as “Miss Democracy” would crown the new Queen of the May. Class. Some of the float themes were “Time Out for Tears” and “It’s Been a Long, Long Time”. After four years, the tradition of planning the event was passed onto the newly formed Water Carnival Board. Their first planned theme was “Worship of the Spartan Gods”. The water carnival was a favorite tradition among students and happened almost every June. However, during some years of the depression as well as World War II, there was neither time nor money to plan the carnival. Often times, if it would rain, the carnival would be postponed, for no one enjoyed sitting outside in a damp atmosphere. The water carnival tradition stopped in 1969 but was resurrected in 2005 as MSU students celebrated the University’s 150th Anniversary. These MSU traditions marked the end of the road for the senior classes. With graduation approaching, I would like to wish our graduating seniors good luck and congrats! Last week the commencement speaker who will be addressing MSU’s graduating class of 2011 was announced. Steve Wozniak, co-founder of Apple Inc., will be delivering long lasting words to excited seniors. 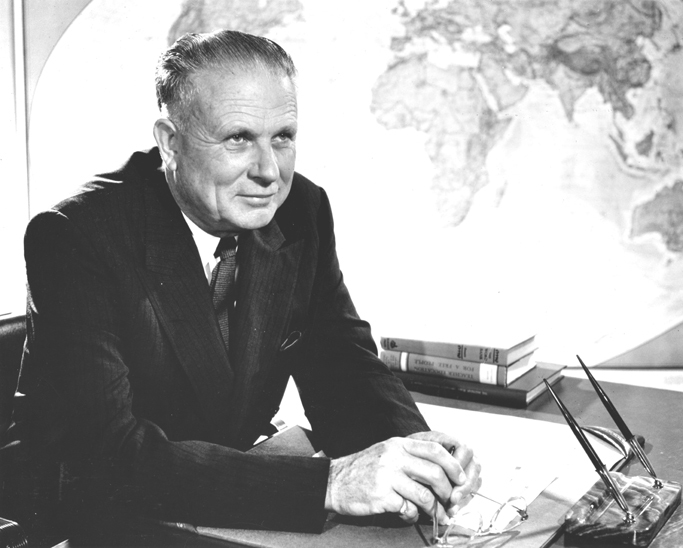 Michigan State has had a long tradition of inviting distinguished citizens to speak at the undergraduate fall and spring commencement ceremonies, as well as the advanced degree commencements. Commencement speeches haven’t always been delivered by famous people or distinguished individuals, nor have they been the cheapest thing either. Individuals who have spoken at MSU over the past 150 years have had exemplary accomplishments and values. The tradition of commencement speaking began in 1861 (this is the first year we have documentation of a commencement speaker), however, the college had not yet gotten into the tradition of bringing in outside individuals. In the earlier years of speeches, the college would give the students an opportunity to address their graduating class. Numbers of student orators ranged from seven to thirteen depending on how many individuals were in the graduating class and they were given anywhere from five to twelve minutes to deliver their speeches. This tradition still lives on, for each year the university chooses one graduating senior to deliver a speech to his or her fellow classmates. Currently, the University hosts two graduation ceremonies, one in the fall, and one in the spring. This tradition has also evolved over the years. 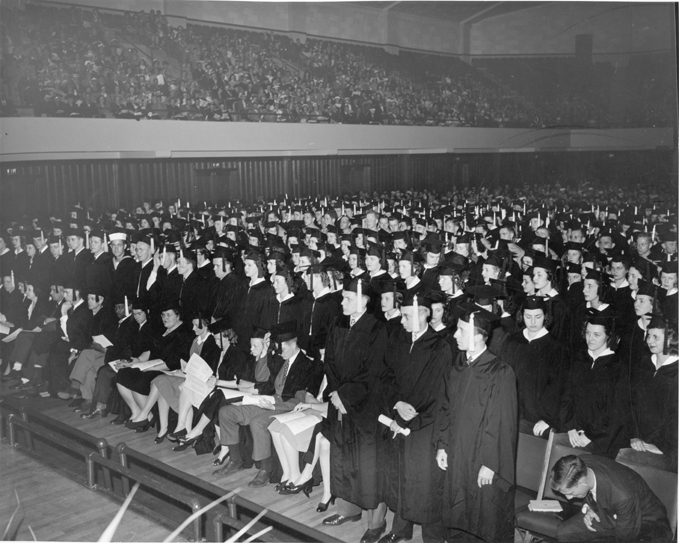 Until 1951 the university only had one graduation ceremony. This changed in 1952 when there were three separate commencement events, spring, winter, and fall. In 1992, this changed yet again, and the university would hold only two ceremonies, one in the spring and one in the fall. We still follow this tradition today. Today, the University strives to bring in a distinguished citizen of society. Bringing in these individuals is not as easy or inexpensive as you may think. This act often comes with a hefty price tag. The most money spent on a commencement speaker was for President Bill Clinton in 1995. A VIP brunch was held for the president which cost $100,000; this was funded by the Jenison Fund, a fund set aside by the university for special events. For this event, the alumni association spent $37,000 on decorations alone. After all was said and done, the total cost to bring President Clinton to MSU was $528,000! 1950: The Honorable Alben W. Barkley, Vice President of the United States, Washington, D.C.
2004-S: Condoleezza Rice, Assistant to the President for National Security Affairs, National Security Council, Washington, D.C.
2005-S: Maya Angelou, Best-Selling Author and Inaugural Poet, Civil Rights Activist, Educator, Historian, Actress, Playwright, Producer and Director. I look forward to see who will be the future commencement speakers for the graduating classes of MSU. For the complete list of commencement speakers, click here.